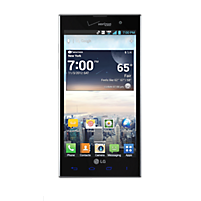 Verizon is currently issuing OTA updates to a number of its midrange handsets. Yesterday we reported on an update rolling out to the LG Lucid, and now it's the LG Spectrum 2's turn. The Spectrum 2's update isn't exactly more exciting than the Lucid's was, but it's nice to see both devices getting some love. This latest update primarily deals with all the bloatware that comes pre-installed on the device. While you may be happy to know that Verizon Remote Diagnostics will be gone following the reboot, much of what remains is getting bumped up. 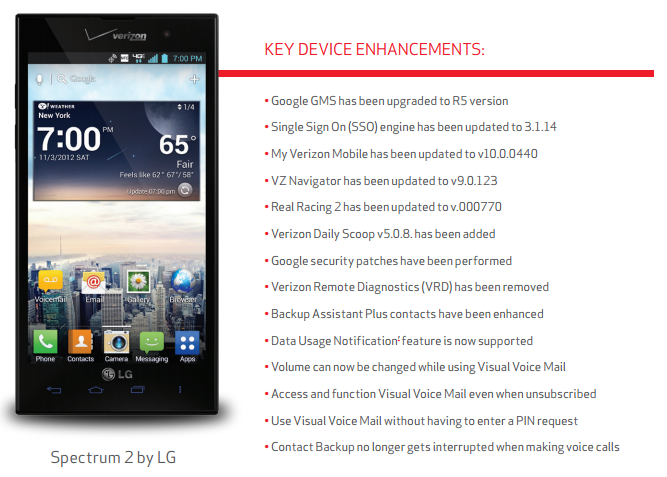 My Verizon Mobile, VZ Navigator, Verizon Daily Scoop, and Real Racing 2 have all been updated, and a number of enhancements have found their way into Visual Voice Mail. You're getting security updates within this OTA, though, so it's worth the few moments of your time it will take to install. That's all for now. It's nothing too exciting, but it's better than neglect.